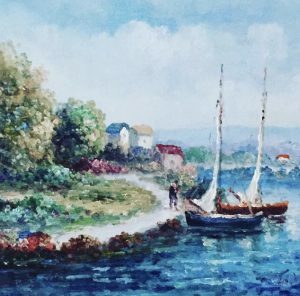 As a child, Michael Aaron Gallagher’s favorite works of art were by Cubist painters Pablo Picasso and Georges Braque, sculptor Constantin Brancusi, and Hudson River School painter Thomas Cole’s “The Course of Empire” series. His introduction to the Impressionist movement came at the Houston Museum of Art, where he saw Claude Monet’s work for the first time. “Women with parasols” by Du Bois. Impressionist painting. Oil on canvas. It wasn’t until many years later that he rediscovered his love for art and found a new passion for the Impressionist masters. Soon, he would decide to go on an art-seeing journey to view the works of French Impressionist painter Pierre-Auguste Renoir in person, an adventure that would lead straight to The Barnes Foundation, which houses the largest collection of Renoir paintings in the world, at 181 works. Seascape impressionism oil on canvas by John Moris. Around this time, his own personal art collection began to include Impressionist style paintings ranging from antique to modern. 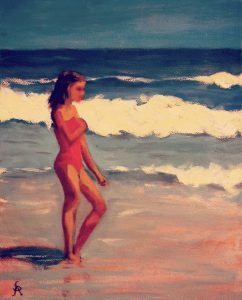 One of his more recent acquisitions is a small painting of a girl walking on the beach by Scott Aycock, an artist and author who has his own radio show on NPR in Tulsa, Oklahoma and is married to the impressionist painter Margaret Aycock. Although the composition is simple, there is a calm, relaxing artistry to the piece, particularly in the way the sand looks like a sunset, the earth and sky blend into one, and the movement of the waves emit shadows of light and darkness. 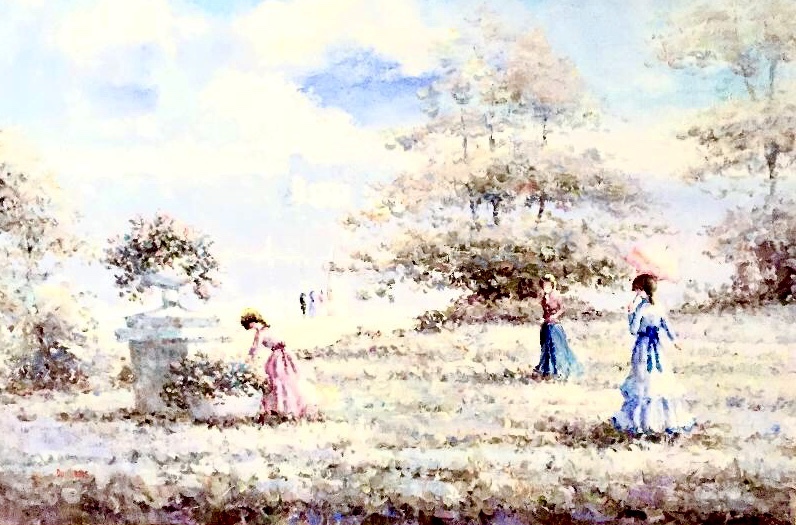 From women with parasols out for a stroll through the countryside to an old view of the canal in Venice, Italy, his collection of Impressionist paintings with their short, delicate brushwork and subtle hues create a blurry visual oasis and add an intriguing depth to his art collection. For more about Scott Aycock’s work, visit www.scottaycock.com. To view more original works of art in The Michael Aaron Gallagher Collection click here.